If it’s not apparent after all these pages and words that I love Serah, I don’t know how else to convince you, dear visitor. Promises is, was, a labour of love. Making shrines and tributes is something I’ve always struggled with. Prior to Promises, my only other shrine was to Kairi of Kingdom Hearts which has hardly had the most stellar of histories or content; it took years to complete and went through multiple rewrites before getting there. I’m trying to improve as a site maker and writer - I sincerely hope I have! - but it was with Serah that I chose to start. No, I had to make a tribute for Serah. I had to stop saying “someday” and make it “today” instead. Serah is my favourite character out of the Final Fantasy series: she’s also my favourite out of XIII, and given that they’re all very dear to my heart, that itself says something. It’s not just her standing for me in Final Fantasy, either - Serah is the one. The one that, if I were asked to pick my most firmest favourite of all my favourite characters, it would be Serah. For the past seven years it’s been her. She’s stayed with me, and I don’t want her to leave… but how did she come to be that? It was, in fact, early on. Like many, my enthusiasm for XIII dulled as time passed but it was Serah and Hope’s dual reveal that garnered my attention. Suddenly I was excited for the game again. When it came, I loved her; even though her role in XIII was small, I could see the potential that lies beneath. I had the chance to RP her in a game over at dreamwidth and really got to know her, inside and out. And then Square gave her her own game. That doesn’t usually happen for my favourites. I figured out who she was, and I was right, and that’s incredibly elating. It’s hard to really sum up ‘why Serah’, because for me, Serah just is. She has been for so long, it’s taken a whole site and forty plus pages in googledocs to really get my feelings for her out. I’m satisfied with what’s come out of it! 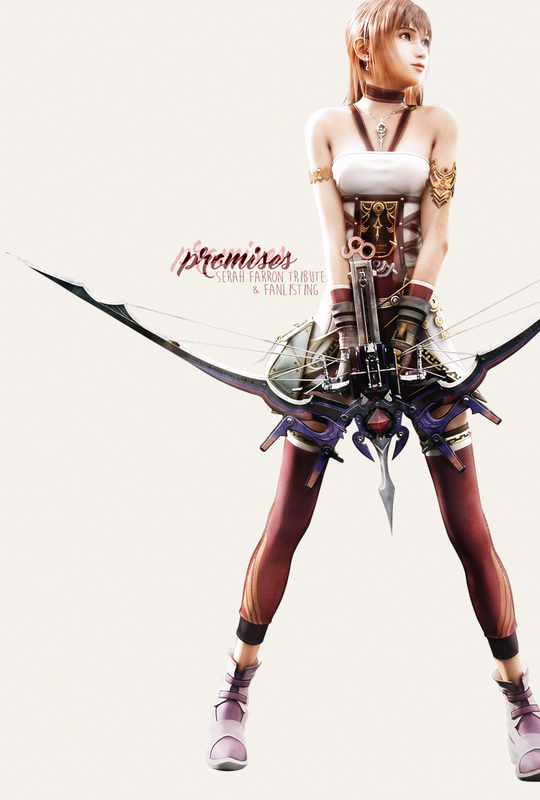 And hopefully, Promises has given you a decent insight into Serah as a character. My first thoughts about making a shrine to Serah were fleeting ones following my playthrough of XIII-2 in 2012, because I sucked at shrine making. But after I completed Lightning Returns in 2014, I changed my mind. I went about the basics, wrote an index page, coded a layout, and… stopped. Because that’s what Rems does with shrine ideas. I still have that first version of Promises on my hardrive. Back then, the name I had in mind for Serah’s tribute was actually The Seeress, which was fine, but it didn’t feel personal enough to Serah - it’s also Yeul’s territory. I’m not sure at what point I settled upon Promises, but I can say why. For starters, the title theme for Final Fantasy XIII is called ‘The Promise’, and is an instrumental version of Serah’s motif; she’ll find Lightning; she’ll save the world. There’s also Vanille’s line, too, of prayers turning to promises, and fate not being able to stand in their way, which reminds me of the Farron siblings in general. No matter what becomes of Serah, it’s her bonds with others, the promises she shares, that’ll see her through. Simply put, Promises is a perfect name and one I’m very happy about. When I was approved for Serah’s fanlisting in early 2016, enough was enough. It was time to show the world that Rems was capable of producing something. The layout came first for the fanlisting’s deadline but it was always made with the tribute in mind. I signed up for Dynamic Duos at Amassment and got to work on writing pages. I reached a staggering ten and then stopped for over six months. Rems why are you this way. On the heels of a very successful Nanowrimo, I decided to take a break from it and use my revived writing energy on something productive, like, actually finishing Serah that year or bust. Three weeks later, with twenty plus more pages and a whole lot of rewrites, Promises was finally finished. Promises was officially opened on 23rd December 2016, just in time for my birthday (happy quarter of a century, me). Here’s to many years! I’d like to thank my Dynamic Duo partner, Larissa, for her enthusiasm and encouragement, for making me believe I could actually do, write, and finish this site. Even though Serah was never realised for that event, she has cheered me on every step of the way and I’m delighted to share this fandom with her... and that I can rely on my tumblr tag essays to invoke the feelings for anyone, not just the Farrons. She also helped me out when I was editing, which was a fun gdocs experience for everyone - thanks for making me laugh. You’re great and I’m so thankful and I hope you’re reading this! Stay awesome. To all those on twitter who’ve cheered me on whenever I made an update and flooded my phone with words of excitement due to looking forward to the finished product, it meant the world. You’re all fabulous and I’m so glad to know all of you. To Amassment and its community of talented shrine makers, I thank you for your inspiration and community and boundless enthusiasm. I’m proud to be a small part of it. Keep creating! And to you, visitor, for taking the time to indulge me by reading my words, right down to this line. Thanks for visiting and spending time with my Serah thoughts, whoever you are. It means more than I could really say. Thank you so much. Hearts and hugs.